Dallas, TX – August 14, 2018 – Aereos, experts in component MRO, FAA approved repairs and precision aerospace manufacturing, announced today that the company will attend the “most productive aviation conference worldwide.” The Air Carriers Purchasing Conference (ACPC) has a history of providing a fair and level environment for buyers and sellers of aviation-related goods. The four day event in Orlando, Florida includes various business and social agendas for purposeful networking. 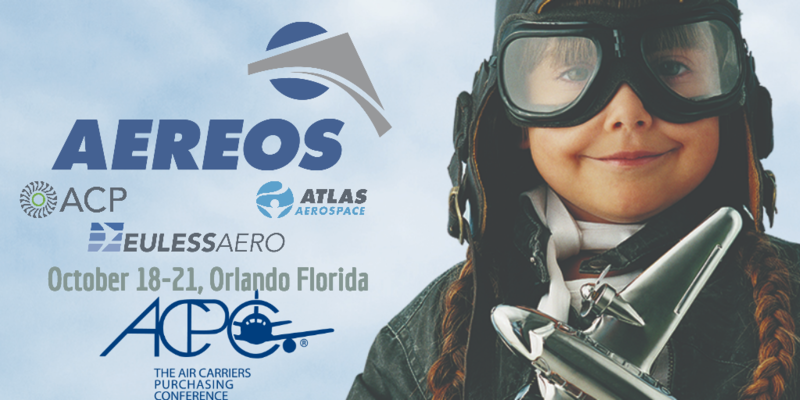 Aereos has been a corporate sponsor of the ACPC for several years. The ACPC has several keynote speakers and professional development sessions throughout the four days beginning on Saturday. There are several meet-and-greet sessions scheduled, private sessions, and public networking forums. There are also a number of social events throughout the weekend including dinners and dances, a golf tournament, and a charity auction to raise money for The National Multiple Sclerosis Society. Along with donating to and participating in the charity auction, Aereos will be visible throughout the weekend. At the Saturday Splash Pad, representatives from Aereos will be handing out complimentary visors and sunscreen, and on Sunday, each operating company’s booth will be handing out aviator sunglasses. Aereos and family companies, Airline Component Parts (ACP), Atlas Aerospace and EulessAero are four of the 789 supply-side companies attending. Representatives will be on-hand throughout the weekend to discuss the numerous Aereos offerings, including FAA-Approved repairs and state-of-the-art aerospace manufacturing. Attendees and exhibitors are encouraged to stop by each of Aereos’ booths to talk with company’s experts about the latest capabilities. ACP, Atlas Aerospace and EulessAero will also have business card drawings for FitBits at 3 p.m. on Monday of the conference.